How to measure for our dog collars. If you do not have a cloth tape measure, use a string & a ruler. All dog collar companies size their dog collars differently. Some size to the middle hole while others size to the end hole. 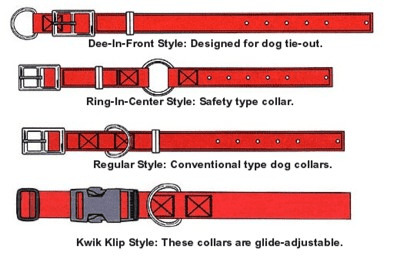 Most of our collars are sized from tip to tip. For example on most 3/4 inch wide you will need to add about 3 inches to the dogs exact neck size. For 1 inch wide collars you will need to add about 4 inches to the dogs exact neck size. If in doult, order the bigger size. You can add another hole to the collar if it is a little too long, but you can not add more collar if the collar is too short. Latigo leather is the best leather for dog collars. It is available in 1 or 2 ply thickness. All of our leather dog collars are proudly made in the USA! Sunglo dog collars are polyurethane coated nylon. This dog collar is water repellent, durable and easily cleaned. Our Sunglo dog collar is the most preferred by duck and bird hunters.